Talking with Kory on the phone. I say, "I've just got a million things to do and--"
"-- and you don't feel like doing any of them right now." first guy, and so on. Not bad for a sequel with as hard an act to follow as Men in Black. We all laughed and had a good time. I loved the contents of locker C-18 (but I thought it should have been #17...). Well, we're back from Origins and we're really really tired. As usual, catching up after a weekend like that can take some doing, particularly when we also had new deadlines (like finalizing the Nanofictionary rulebook and celebrating Kristin's Birthday) to attend to. As a result, I haven't finished sorting through all the pictures I took, so you'll have to wait until later for the photo album. 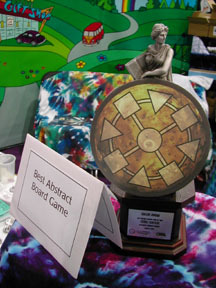 Again this year I took home an Origins Award, this time for Cosmic Coasters, which was named Best Abstract Board Game of the Year! Thanks for voting for us! I also took home 2 medallions, one for the RAMbots tournament, the other for the Proton Challenge. I was particularly proud of the RAMbots win, since I came back to victory in one game after a devastating early round which left me with just 3 instructions to program with. This year's Booth and Lab spaces were better than ever. The Lab was remarkably close to the Booth, which was the biggest we've ever had (a triple) and was squarely in front of one of the 2 entrance points of the exhibit hall. The Lab was actually slightly smaller than last year's, but the new furniture arrangement was a big improvement. Everything ran smoothly and everyone had a great time! New features like seminars and the craft area were very well received. We had a bigger crowd at our game design seminar than Reiner Knizia had at his! Wow! I was honored to be one of 5 "Iron Game Designers" for a game-design competition based on the TV show "Iron Chef". And since I was not chosen that day to do battle in the Game Design Stadium, I got to just hang out and act like a big shot with James Ernest (instead of having to design a game using little plastic trucks). Speaking of TV, I was interviewed for a public access cable-tv show in Ft. Wayne Indiana called The Gamer. Watch for it if you live out there! The first ever Nanofictionary tournament went pretty well considering, and I got some excellent feedback on the rulebook (just in time, too, since it went to the printers yesterday morning). While I'm at it, a hearty Well-Done to the Icehouse Finalists (Ryan McGuire, Jacob Davenport, and Dan Isaac), the Fluxx finalists (Thom Herchenrader, Keith Cutshall, Eric Zuckerman, and Chris Pollichemi), the Gnostica finalists (Jacob Davenport, Kory Heath, and Nathan Dilday), and the Chrononauts finalists (Larry Kozlowski, Steven Gifford, and Chris Sessoms). Lastly, Jolly Good Show to Cayce Duda, who came so close to winning the Q-Turn Challenge, and to everyone else who gave it their best. Well gamed, folks! Late night Werewolf hunting proved to be extremely popular. Every night, we had around 50 people playing, in 4 or 5 different games, many spilling out into the hall. Reportedly some of these gamers kept at it until after breakfast. Becca's Recycling program was again a huge hit... this time we had tie-dyed bins set up all over, and we were constantly thanked for providing a service the convention center was ignoring. Thanks Becca! Lastly, I got some excellent advice and insights from Mike Sugarbaker, on how we should be marketing Icehouse. Thanks, Mike! And thanks also for voting for Cosmic Coasters!